I’ve discovered that most people either love or hate deviled eggs. There is no in between. In our family of 6, we are split evenly with 3 thumbs up and 3 thumbs down. But those who adore deviled eggs so passionately declare them a holiday entertaining must on the appetizer table. We also attend several holiday potlucks, and deviled eggs are a fan favorite there, too. While there are many ways of making deviled eggs, this is the best deviled eggs recipe that our family loves. After all, it is topped with bacon, and bacon makes everything completely awesome! What are your best kitchen hacks when you are short on time? I often find myself forgetting to soften butter for a recipe and then having to keep my half-made recipe on hold until its softened! 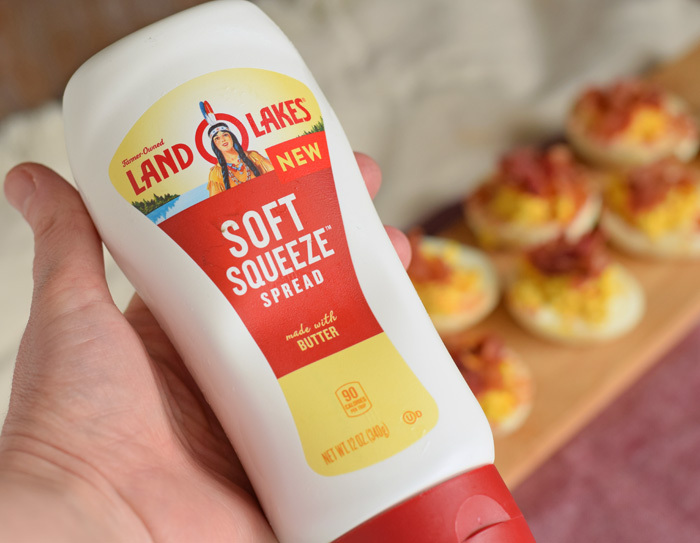 Land O Lakes® Soft Squeeze™ Spread is an easy to squeeze solution, made with real butter, and is convenient right out of the refrigerator. First, hard boil the eggs. 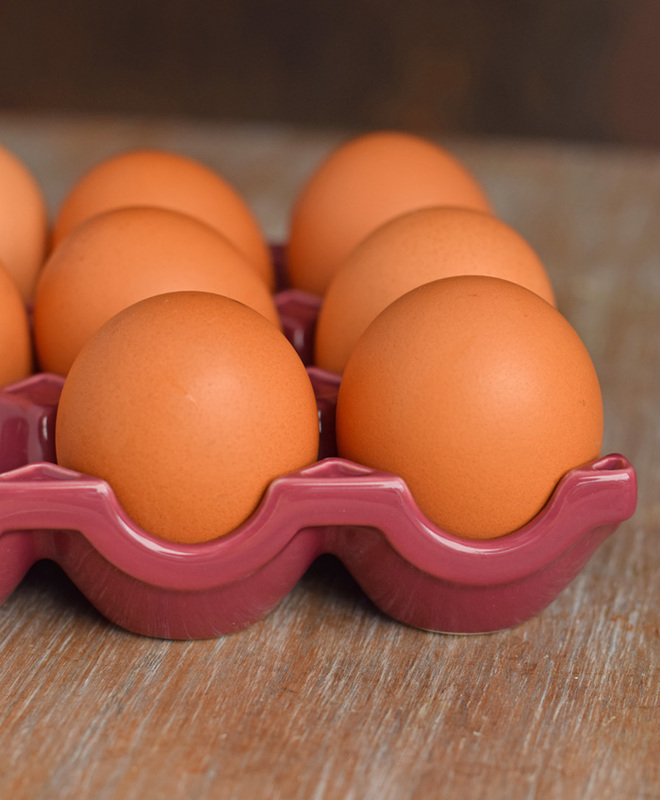 I’ve tried a few hard boiling methods over the years, and the best way that I have found is to place the eggs in a large pot and cover them with water. Heat on medium-high heat until boiling. Allow the eggs to boil for a minute, then remove from heat. Cover the pot with a lid and allow them to sit for 15 minutes. Prepare a large bowl with ice and ice cold water. After the 15 minutes, place the eggs in the ice bath. Allow the eggs to cool. Peel the shells from the eggs. 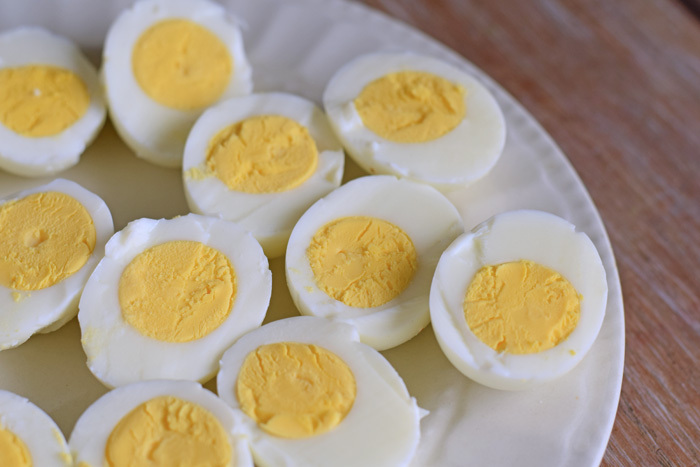 Remove the yellow centers from the eggs and place them in a bowl. 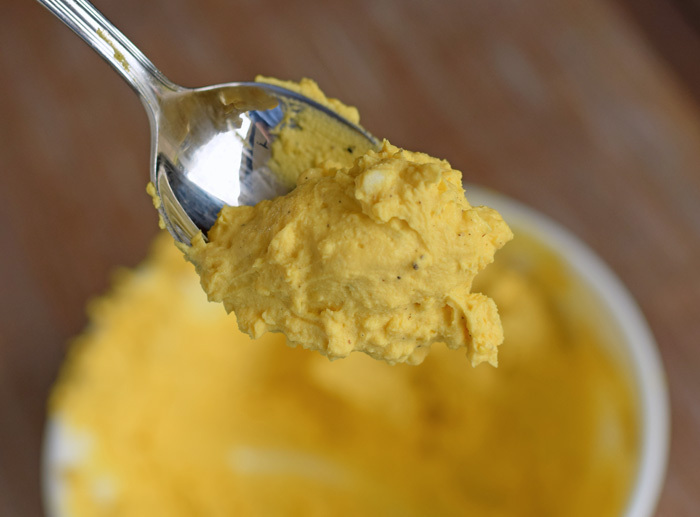 Add the yellow mustard, mayo, and Land O Lakes® Soft Squeeze™ Spread to the bowl. Add black pepper and Pink Himalayan sea salt to taste. Use a fork to mash the mixture together, stirring it with a spoon after mashing to thoroughly combine the textures. Place a bit of the mixture back in the center of each egg. Sprinkle with a bit of paprika over each egg. Top with the bacon crumbles. Serve as part of your holiday appetizer table or take along to your holiday potluck. 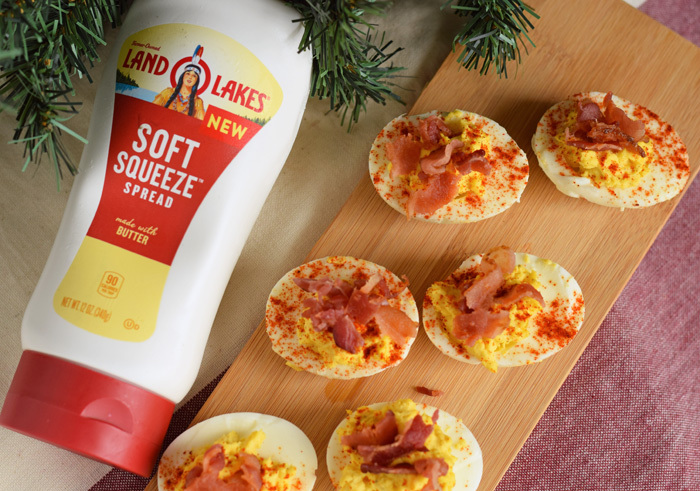 Find the NEW Land O Lakes® Soft Squeeze™ Spread at a Kroger or Kroger banner store near you. 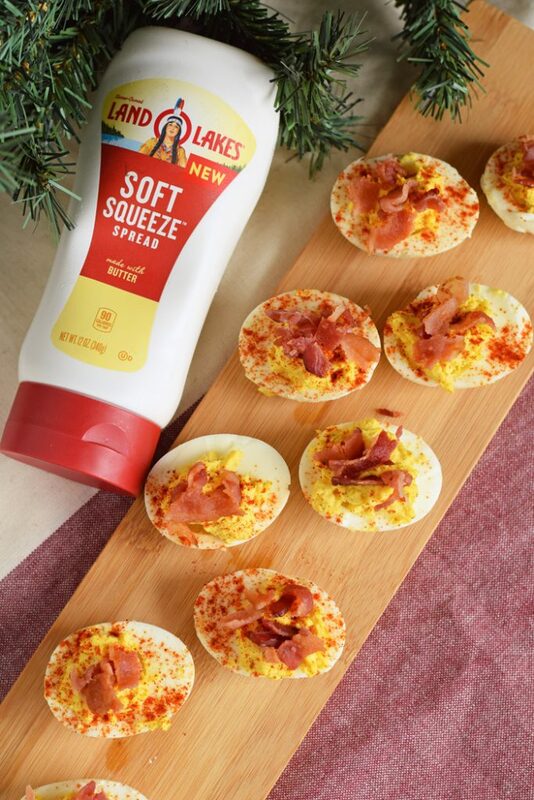 Click the coupon image below to save $0.75 off ONE (1) Land O’Lakes Soft Squeeze® Spread. Just might have to try out this new mayo. Using it in devil eggs would be perfect and give them a different taste. I love deviled eggs anyway that I can get them! I really love this idea and I think I might make some of these for Thanksgiving. I’ll have to try them this way! 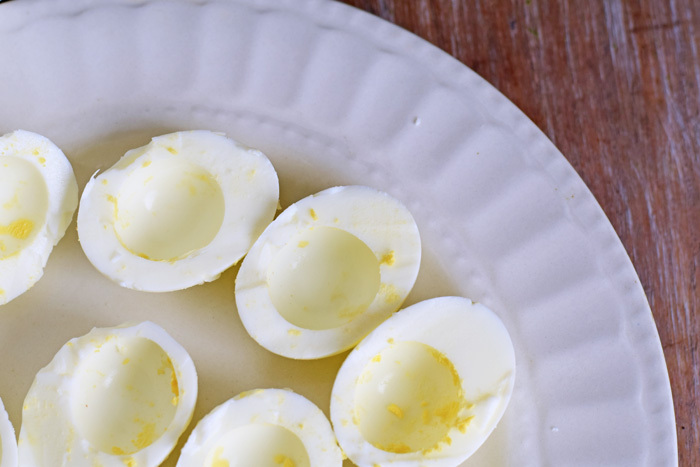 We love regular deviled eggs, but now I’m intrigued by these. So we’ll have the ones we make, plus these. Thanks for the coupon. My Pops is the deviled egg maker in our family. He brings them for every family potluck. I don’t know if he uses butter spread in his recipe but it would definitely make for a creamy deviled egg. 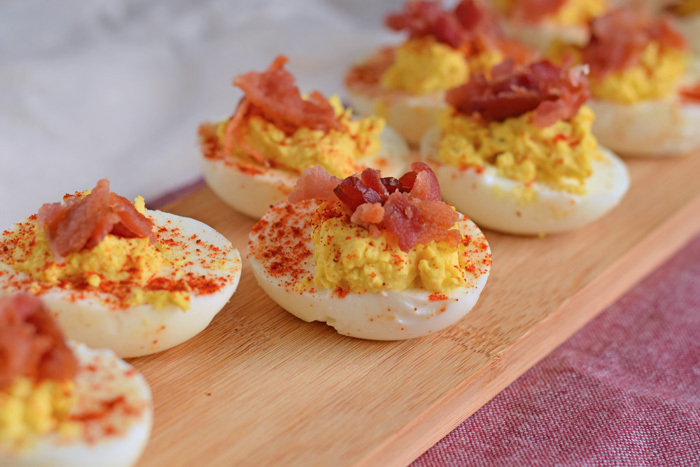 Those deviled eggs are a great idea for any party or Thanksgiving. I will try that recipe and the Land O Lakes is a graet brand. This is an interesting take on deviled eggs. I’ve never seen anyone use butter in them before. I think I say this everytime I see a deviled egg recipe but I’ve never had them! I totally need to change that and what better to do that with than the best deviled egg recipe! Deviled eggs are always a hit at our holiday gatherings. I’ll have to try this recipe out next time. I love deviled eggs. They are my passion. I need to make your recipe soon. 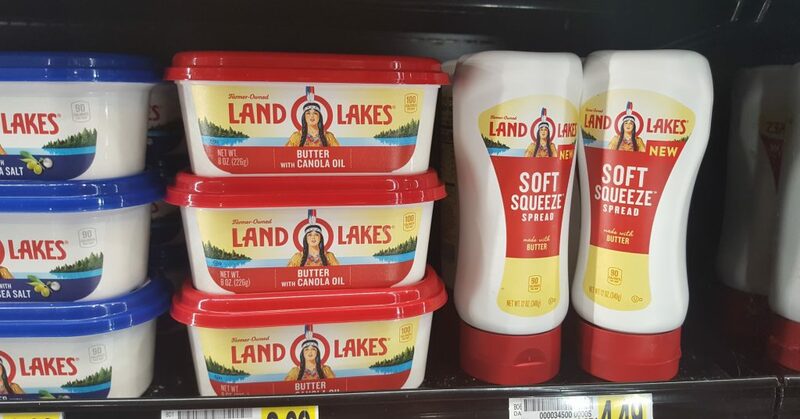 That land o lakes spread sounds really good. We don’t have deviled eggs very often – usually just after Easter when we are trying to use up eggs. I’ll have to try out your recipe and make these when we have guests. Deviled Eggs just may be my favorite side dish for any occasion! I need to try your recipe, I have never put butter in mine before! Funny you post this. My grandmother died about 5 years ago and we have not had deviled eggs since. She took her recipe with her. I will try these. They won’t be the same but maybe we can have a new tradition recipe! Omg, yes! This looks so delicious. I honestly haven’t tried making deviled egg ever. But I am curious of the taste. Every Sunday we make deviled eggs for our church potluck. This would be a recipe I think everyone would enjoy. I love the avocado mayo used in the recipe thanks for sharing. This looks delish!! I love deviled eggs, but have never actually made them 🙂 I’ll have to try! This deviled eggs looks delicious I can eat few of them I am going to check it out this spreadable with butter. Perfect for thanksgiving menu.